Let’s be real here! If you read my last post in this series – Then you will know, that my birthday was a hot mess. My family had good intentions, my Mum even flew with cards, cake and presents in her carry on. But the travel God’s had slapped this birthday diva in the face. So, I simply decided that we would move my birthday – Most girls have a birthday month anyway. I woke up Saturday cradled in a white cloud. This is not one of those overly cheesy descriptions Hilton beds are seriously comfortable. There was even a pillow menu encase you had different preferences. Now that I was no longer a cold, hungry, sleep deprived mess who looked quite frankly like she had been dragged through a hedge. I could appreciate the beauty of my surroundings. Well…After I put my glasses on, my eyesight is abysmal. It was, hands down, the biggest hotel room I had every stayed in! When you entered the room: to the right there were two wardrobes, with a three-way mirror in the centre of them (That thing was so handy for seeing the back of your head, I loved it) And to the left was a full length double mirror, which was actually a sliding door to the bathroom. Beyond the hall there was a gargantuan bedroom – Two double beds, each with a bedside table, faced a huge plasma TV and a luggage rack. Next, to the beds, there was an armchair, a tiny table and an oversized lamp that made me feel like I was in Toy Story. Opposite this was a desk and wheelie chair. The sliding French doors gave way to a vast balcony, part covered and part uncovered. That had a view that would make any cruise addicts heart soar. A marina view! I cannot even begin to tell you the amount of yacht envy I had all weekend long. I NEED a yacht in my life A.S.A.P – If anyone knows how to win the lottery please enlighten this Northern girl because boats. After I pried myself from the soft sheets, took a really long shower and dressed in new shorts I was ready for adventure. The hotel concierge kindly told us what bus to get to Medina and off we went (Travel tip: If you are using the bus in Malta then bus tickets are valid for two hours! No need to buy a new ticket for your connection) Medina was the best decision I made all weekend! This history dork fell head over heels. I was so enamoured that I announced I wanted to move there. However having explored the house prices a lottery win is also needed for that particular venture. Malta is big on festivals, when we attempted to pass through the city walls we were halted by people in medieval garb and met with the sound of ceremonial drums. There was a parade waiting to pass through and it was hands down the most bizarre experience of my life. It was like a living museum. I think the oddest thing for me was that they were all so serious about it; I cannot imagine my brother telling me that he was going to dress in medieval clothes at the weekend and essentially live action role-play. But as odd as it may have been to this English girl, I loved it! It really brought the historical city to life. As the participants of the parade then went on to set up stalls, performances and activities; throughout the tiny winding streets of a city untouched by time. Once we had watched the parade pass through, we were able to enter and do something else that pleased my dorky soul. We went into the Medina dungeons. These were much like the dungeons you get in major historical cities in the UK. With one major difference…An adult admission was only TWO EUROS! It was small but still amusing and taught us some of Medina’s history. Before we emerged to spend a morning wandering around the sun-drenched city. In, the afternoon we swapped to the current capital. Explored its quirks and lived life like Europeans by taking in some café culture at lunch time. 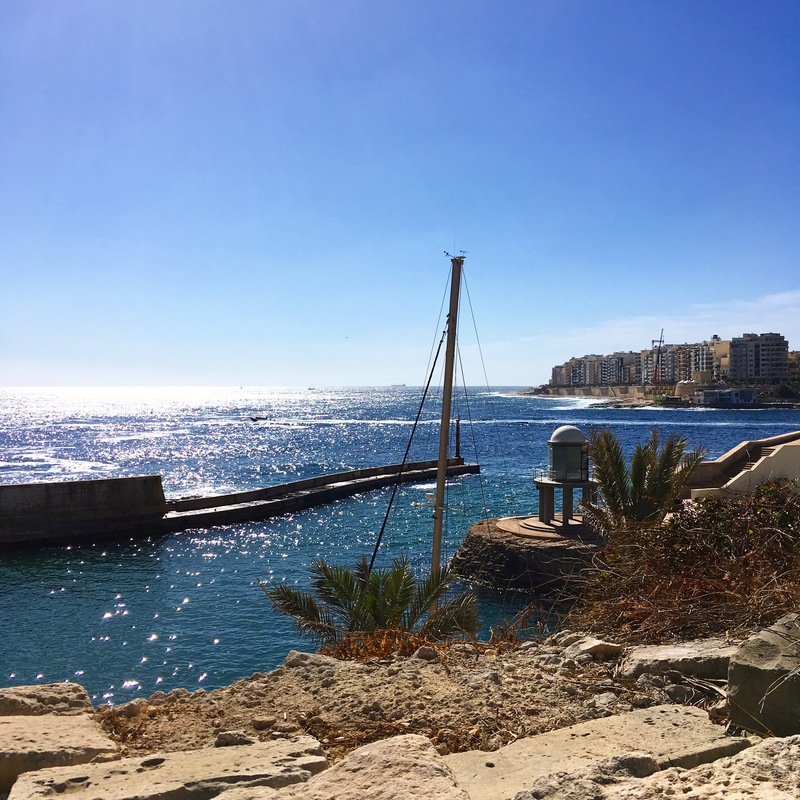 Valletta will certainly hone your calf muscles on their killer hills; you would certainly be fit if you lived there. But luckily this charming city is well worth the effort. My number one recommendation would be to head to the Upper Barraka gardens, the view they provide is to die for. I could have stood up there all day. After, Valletta, we headed back towards our beautiful hotel. We grabbed some gelato as we headed through St Julian’s and ate it as we walked around the marina that wrapped around part of the hotel. This day had already been bliss and it only got better – The maid (Josephine) had made me a towel animal!! (those things always make me ridiculously happy) I ate birthday cake on a balcony that was baking in the sun, took a giant bubble bath and sprawled across my bed to relax before heading out for the night. Dinner was eaten in St Julian’s and I wish I could say it was followed by cocktails. But anyone who knows me knows that I am not that rock and roll! So, it was in fact followed by a pot of tea in my stunning hotel. I definitely was not born on April 29th but this year that was my unofficial birthday and it was glorious. After all, everyone does always say that good things are worth waiting for!